Town in the Crimea, Russia. It existed as a Greek colony at the beginning of the common era, and, like the rest of such colonies, it undoubtedly had some Jewish inhabitants. It was destroyed in the second century, and was rebuilt as Kaffa. 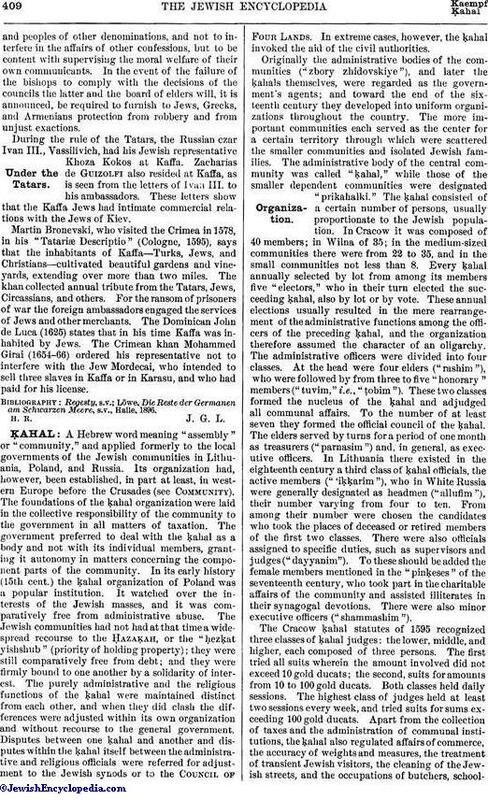 Inscriptions bearing the dates 909 and 1018 have been found in the Rabbinite synagogue; from these it is seen that the older settlement had a well-organized Jewish community. In 1266 the new town was established by the Genoese in the vicinity of the old one, and among its inhabitants were both Rabbinites and Karaites, as is indicated by an epigraph on a scroll of the Law, preserved in the Karaite synagogue, in which one Shabbethai, the son of Isaac, announces his gift of the scroll to the Karaite synagogue of Kirim (Sulchat) in 1274. The Ark of the Covenant of the Rabbinite synagogue of Kaffa bears the date 1309. Another scroll of the Law, preserved in the same synagogue, was dedicated by Eleazar ben Jacob to the community of Sulchat, and bears the date 1320-50. An inscription in the Karaite synagogue, dated 1409, bears the signatures of Isaac, son of Moses, and Sarah, daughter of Moses. A tombstone, bearing the date 1457, is now used as a cover for the synagogue well at Kaffa. Another slab, preserved in the museum of Kaffa, once served as the gravestone of Rabbi Abraham, son of Naḥmu, who died Feb. 1, 1502. Still another tombstone, dated 1508, bears the name of Rabbi Joshua, son of Rabbi Meïr Ashkenazi of Taman. There are also gravestones dated 1540 and 1553. Johann Schültberger, who from 1394 to 1427 traveled in Europe, Asia, and Africa, states in his description of Kaffa that there were two sects of Jews there with separate synagogues, and that there were 4,000 Jewish houses in the suburbs. In the constitution of the Genoese colonies on the Black Sea, issued at Genoa Feb. 28, 1449, the bishops of Kaffa are directed not to oppress the Greeks, Armenians, Jews,and peoples of other denominations, and not to interfere in the affairs of other confessions, but to be content with supervising the moral welfare of their own communicants. In the event of the failure of the bishops to comply with the decisions of the councils the latter and the board of elders will, it is announced, be required to furnish to Jews, Greeks, and Armenians protection from robbery and from unjust exactions. During the rule of the Tatars, the Russian czar Ivan III., Vassilivich, had his Jewish representative Khoza Kokos at Kaffa. Zacharias de Guizolfi also resided at Kaffa, as is seen from the letters of Ivan III. to his ambassadors. 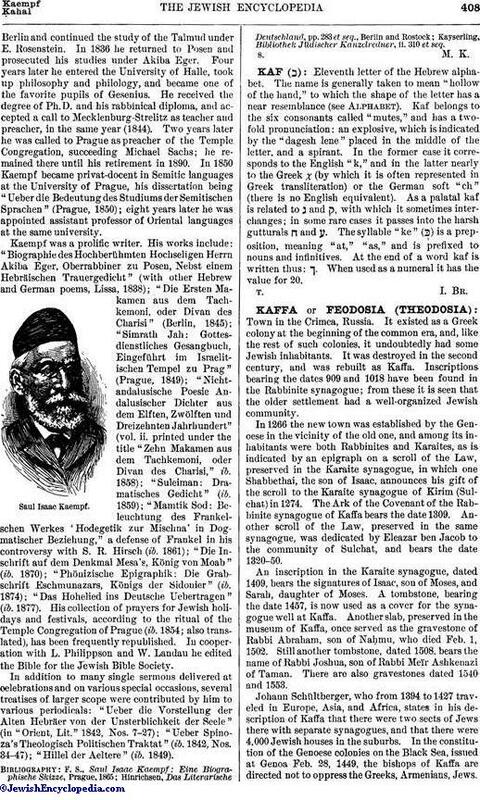 These letters show that the Kaffa Jews had intimate commercial relations with the Jews of Kiev. Martin Bronevski, who visited the Crimea in 1578, in his "Tatariæ Descriptio" (Cologne, 1595), says that the inhabitants of Kaffa—Turks, Jews, and Christians—cultivated beautiful gardens and vineyards, extending over more than two miles. The khan collected annual tribute from the Tatars, Jews, Circassians, and others. For the ransom of prisoners of war the foreign ambassadors engaged the services of Jews and other merchants. The Dominican John de Luca (1625) states that in his time Kaffa was inhabited by Jews. The Crimean khan Mohammed Girai (1654-66) ordered his representative not to interfere with the Jew Mordecai, who intended to sell three slaves in Kaffa or in Karasu, and who had paid for his license. Löwe, Die Reste der Germanen am Schwarzen Meere, s.v., Halle, 1896.